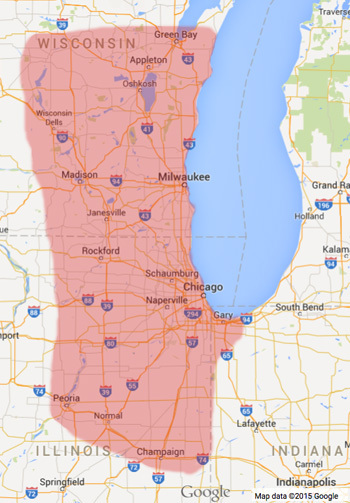 Our distribution radius includes parts of Wisconsin, Illinois and Northwest Indiana. From the north, take the Kennedy Expressway east (I-90/94) for I-94 towards Chicago. Take to 47th Street, turn right onto 47th Street, take 47th Street straight to Racine Avenue, make a right at the light on Racine Avenue and the facility is on the right side of the street. From the south, take the Dan Ryan Expressway west (I-90/94) to exit number 56B, towards 47th Street, merge onto south Wentworth Avenue, turn left onto west 47th Street, take 47th Street to Racine Avenue, turn right onto Racine Avenue, facility is on the right. From the west, Eisenhower Expressway east (I-290), take to the exit for 90/94 east towards Indiana, take to exit for 47th Street, merge onto South Wentworth Ave, turn right onto west 47th Street, turn right onto south Racine Avenue.